Singapore – February 14, 2014 – DyStar is to announce the release of its third annual Sustainability Report. The report provides a valuable insight into DyStar’s progress and initiatives towards sustainability during 2012, following the guidelines of Global Reporting Initiative GRI3.1. On the basis of the GRI application level criteria, the 2012 report has been self-declared as a Level B report, which also includes its performance on the United Nations Global Compact (UNGC) Ten Principles, which the company endorsed in 2011. “Our holistic approach towards sustainability and relentless efforts to achieve our goals resulted in significant improvements through the year 2012”, says Harry Dobrowolski, CEO of DyStar. Some key points include the company’s reduction of its GHG emissions by approximately 13% which is a great step towards its internal target of a 20% reduction by 2020. The success of DyStar’s initiatives has further affirmed the company’s dedication to providing the most sustainable solutions and products to meet customers’ needs, while protecting the environment. “The publication of the 2012 Report underlines the fact that Sustainability Reporting will continue to play a significant role in DyStar’s of its sustainability strategy as it helps us to engage with all our stakeholders and to maintain our leadership in this area of work”, notes Dr. Jain. 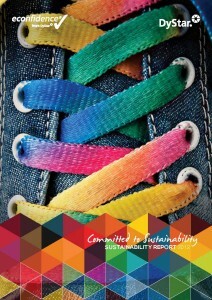 You can download DyStar’s Sustainability Report 2012 from www.DyStar.com. DyStar has also previously released its third Carbon Footprint Report 2012.